down along the adjacent column, which puts a 1 or 0 in each row which i can then filter. I wonder if there is a simpler method using a formula? I want to end up with this in another 2 columns. I have tried =OFFSET($A$2,2,-1) in Column B1 and =OFFSET($A$2,4,-1) in cell B2, dragging down does not increment properly, i need to increment the "2" by 2 on each new row. Put this in B1 copy over and down. Unlike INDIRECT and OFFSET, this is not volatile. Then drag them both down. Not the answer you're looking for? Browse other questions tagged microsoft-excel or ask your own question. 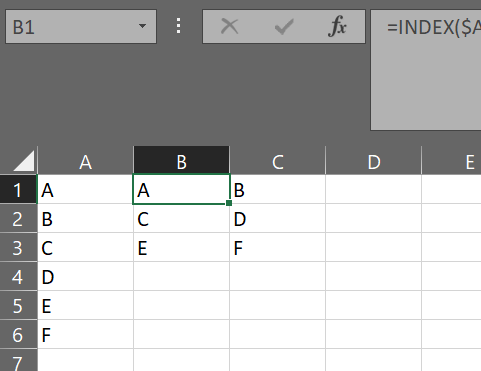 How to split a string based on “:” in MS-Excel? Why doesn't Excel auto-adjust formula when a row is moved?